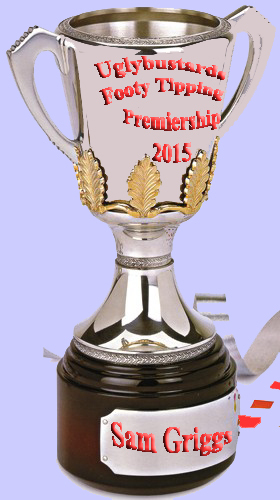 The 2016 Uglybustards Premiership Cup proudly brought to you by Huru Sports, look good play better. In an historic weekend of footy Mik Barley showed class and poise to out-tip the competition in the final few rounds to take out his first Uglybustards title. Congratulations Mik. The 2016 Prize Pool has been finalised in sensashunal sircumstances with the team just scraping in enough punters for a Jackpot as the trading deadline came to a close. Yes all youse bustards come through at the witches hour and we cobbled together the bare minimum of 20! 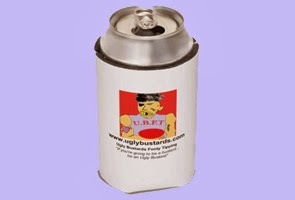 well done all youse bustards!!! Uglybustards Rides Again in 2016! Welcome back all you utter utter bustards for the 17th Uglybustards AFL Footy Tipping Comp and a big welcome to the new tipsters who really don't know what they're letting themselves in for. But first, the unveiling of the cup for the 2015 Champ Sam Griggs who potted his 2nd trophy in 3 years, he is becoming the "Hawthorn" tipster of Uglybustards. Who will knock him off this year?